The gods and goddesses of ancient Greece attract us by their anthropomorphic shapes and their very human passions, but they are no longer held in reverence and appear mostly in the nostalgic daydreams of artists and poets. I am fascinated by the cosmos and am unable to forget the blessed time when Greek gods walked the earth in human form, and I have kept a dialogue with the deities of the Hellenes. This dialogue isnt constant, for there are long periods of silence when my preoccupations lead me in other directions. But cyclically, gods, goddesses, heroes and their legends recur as a golden thread interwoven into the fabric of my life. The oracle unravels its ambiguities, the Sphinx asks its odd question, the seer prophesizes and the painter borrows all the masks and invents new ways to solve the enigmas of the human predicament. I took a rather anti-poetic stance during the 1950s, and so there are few mythological references, except for a series of 21 drawings entitled Paloma-Sphinx (1951), along with a poem that enchanted my children. (The whole was published later in a limited edition.) But beginning in 1961, I started a new mythological cycle of about fifty abstract canvases on the tale of Theseus, Ariane and the Minotaur. It coincided with several extended trips to Greece. At the same time I was in the process of writing Life with Picasso, memoirs of a period offering striking parallelisms with the Myth of the Labyrinth, the Minotaur and Ariane. She is the figure with whom I always identified the most, to the extent of having signed some paintings by that name in 1943 and 1944. Arianes plight reaches its climax when she is betrayed by Theseus  he sails away leaving her abandoned on the isle of Naxos. The intensity of her despair attracts Dionysus concern. Moved by compassion, he goes to her, bestows his love on her and proceeds to her apotheosis by placing her among the constellations. Dionysus was always my favorite god, not so much for his relationship to grapes and wine, but as the dark initiator of the irrational trance of poetry and drama. My Labyrinth Series began with A Window on the Sea (1962), as if the legend originated by gazing at the Mediterranean Sea, imagining Theseus childhood in Trézenè and Arianes own in Crete. The impulse was to discover visual and pictorial equivalences to the dramatic intensity of the myth with dynamic and colorful compositions adorned with pseudo-calligraphic Greek letters for the momentous episodes of the tale as I retraced them in my mind. It was an original approach since following the main episodes of a legend often leads painters to become overly narrative, as was the case for many of the English Pre-Raphaelites. Closeness to a myth needs not be literal and must not aim at an artificial orthodoxy vis-à-vis gods and heroes who are more meaningful to us as archetypes of our own emotions than revered as deities. Antiquity has first to be properly assimilated to revive it and survive it. During the 1960s, I often stayed in Athens and chartered a schooner to sail around the Cyclades and to set anchor at Heraklion in Crete with Claude and Paloma. The fragrances, the flavors, the kindness and generosity of the islanders augmented my tropism for the visible and invisible aspects of Greece. The pink monasteries, the churches and remains of Byzantine palaces with all their charm were no match for the Minoan, Mycenaean Doric or Ionian ruins. They overshadowed everything else even though they resembled the almost toothless jaw of an old crone, as the French poet Pierre Revardy had told me earlier to dampen my enthusiasm. But no one could influence me in this matter and I continued to envision this long gone past as a living source of inspiration for my work. Delphica (1965), Cry of Orestes (1967), Electra (1967), Eros, the Angel of Imbecility (1967), and many other works are witness to that. I wondered if this close intimacy with mythology was an unworthy form of escapism, especially since I followed the teachings of the Zen tradition and wanted to participate in the here and now to the elaboration of the future. On the other hand, the present is just a dividing wall that supports and separated the past from the future. As the Greeks say,  Never pull a nail out of your wall. Your neighbor on the other side may be using its protruding tip as a peg for his hat. So, after 1965 my mythological works made the best possible use of this party wall to invent gods and goddesses who looked like the persons in my life whom I loved best. No longer seeking the intimate realism of my earlier years, I idealized them by plunging them in the still fresh amber of a vast metaphor. Time in and time out, I pursue my utopia of the Greek myths. It allows me to confront my inner anxieties with some joy. History teaches lessons, but legends feed the species. They transcend all to reveal the primal truth, the only one that lasts. More than what to do, they help us to discover who we are. 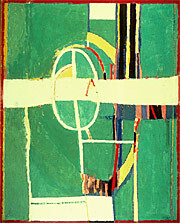 As part of the important Labyrinth Series of paintings, such images were inspired by Gilot's travels with her family on the Aegean Sea in the summer of 1962. Completely introspective, there is nothing descriptive in the paintings of this series - only structures, rhythms, and colors that by themselves evoke the different phases of the legend of Theseus, Ariadne, and the Minotaur. In this work, the red frame painted onto the canvas forms a stylized "window" through which Gilot evokes both the lyrical childhood of Theseus on the island of his birth and the sea vista, which holds his future. 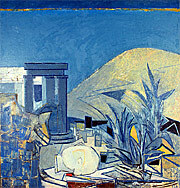 Classical Greek mythology continues as an important leitmotif in Gilot's oeuvre. The predominately black and white linear skein of The Thread plays against Ariadne's colors, red with notes of orange. The intense drama of this combination is the coloristic equivalent of the more tragic path the story begins to take. Gilot conceived the thread, given to Theseus by Ariadne to enable the hero to find his way out of the Labyrinth, as a Tree of Life. 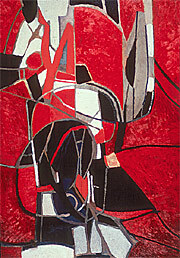 According to Gilot: "... it is the knowledge of life itself and of its patterns that will give Theseus the thread ... the thread is to know ... to know the rhythms that govern the growth of a tree is to know the meanderings of the Labyrinth ..." The central conundrum of the Labyrinth is now revealed: it is the process of self-knowledge. This is a pivotal canvas in the evolution of Gilot's work during the 1960's from more mythological overtones to ones dealing with the differences between the biological cycle of nature and the historical cycle of man. Gilot began exploring this theme just a few years prior to meeting Dr. Jonas Salk during a visit to Southern California in October 1969. In this oil on canvas, Gilot suggests the spirit of the moment when Daphne is transformed into a laurel tree to escape the advances of Apollo. 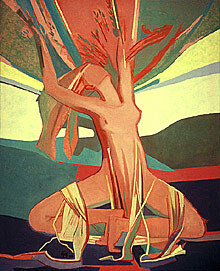 The triangulation of her legs changing to roots is mirrored to give form to her arms extending as the branches of the tree. Apollo's pursuit is evoked only by the presence of a golden glow in the background together with a scare of sunlight on her left arm.